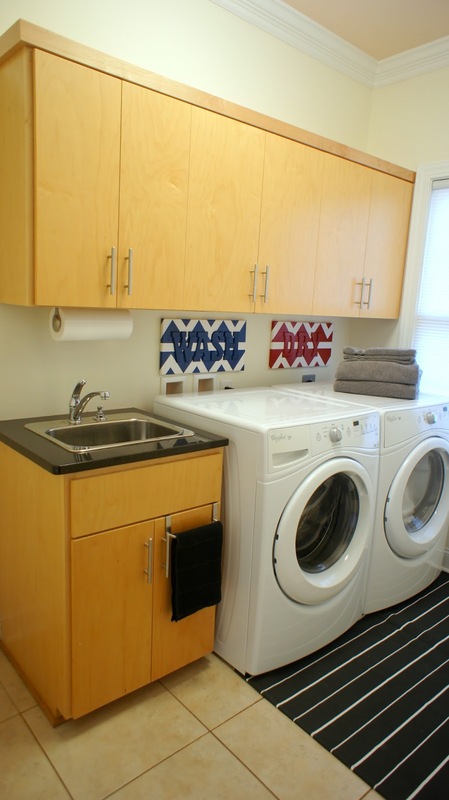 Who loves to do laundry? Not me! 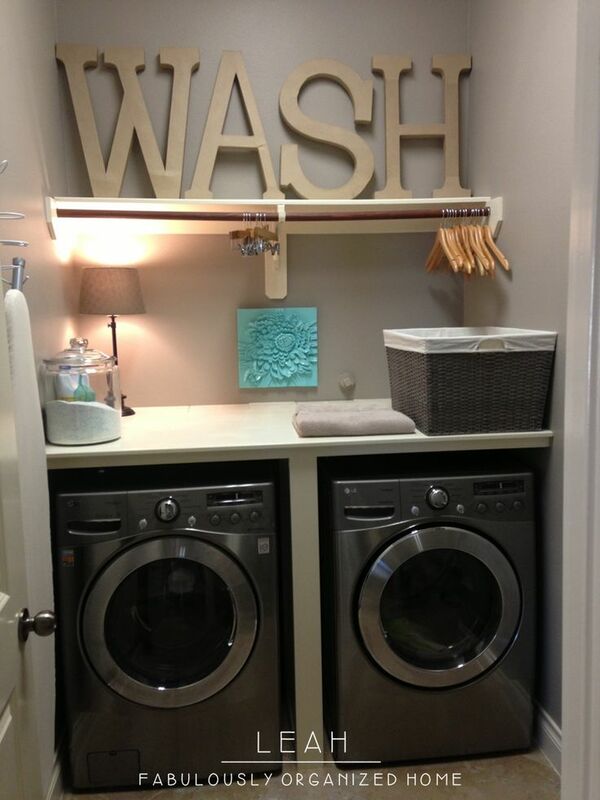 So, I made my laundry room a much nicer place to be. If you are the one that does the laundry for your family, you know how it's.. loads of fun! Why not make it more visually and organizationally appealing. I'm lucky enough to have a room dedicated for laundry in our new house. In our last house, the laundry was done in the unfinished basement area that we used for storage, tech area, and a gym. It was gloomy and cluttered, which made it even worse. 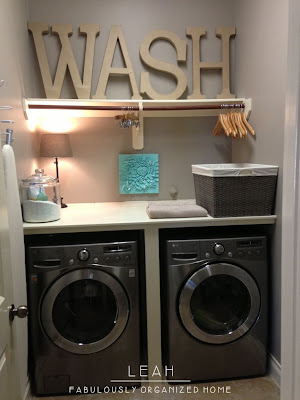 I was inspired by people posting pictures (see below) of some of the projects that they had done and wanted to make my boring laundry room a nicer place to be. I didn’t really need to create storage because the previous owner already had plenty of cabinets and a sink put in when they built the house. However, I needed a space to hang up the clothes that couldn't go in the dryer and I wanted to make it look more appealing to the eye. I had been using a standing drying rack and any piece of furniture or workout machine I could in our last house. It pretty much looked like the dryer blew up clothes all over the basement. The drying rack is still in use and I put in outside once in a while to get that “smell like the sun, but feel like a piece of cardboard” look. That rack also took up all the space in the room so I couldn't access the washer and dryer. 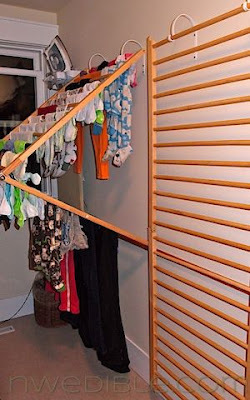 I had posted wall drying racks (see above) right when I joined Pinterest over a year ago. I really wanted them in our last place, but I never actually found what I wanted. 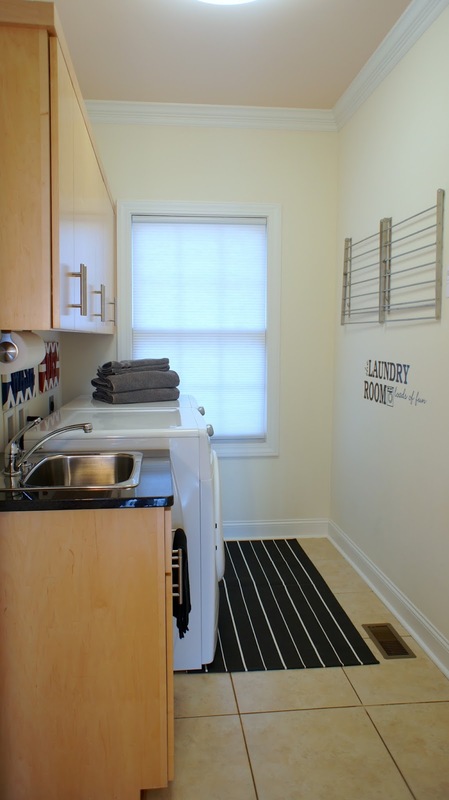 The wall racks were a must in the new laundry room and I owe it all to one of my fave stores…IKEA. These racks are called Grundtal and make me so happy. I know, I sound like a dork, but honestly they collapse and allow me to hang most of the laundry in a space that would regularly be left empty, the wall. Best of all, they are $20 bucks! We bought two because two were needed, and we also have the wall space. When mounting them, make sure you are screwing them into the studs or are using molly screws or toggle bolts on the spots that don't have joists. Home Depot or Lowes sells either of those and they're relatively easy to use. Wet laundry can get heavy and you don’t want holes torn in your wall when the rack falls off full of your clean clothes. Make sure to measure twice so they are even and straight. These guys are the ultimate because they collapse and they hold almost two loads of the shirts and unmentionables that I usually hang up. My husband wears t-shirts quite often they almost never go in the dryer, so I always have the t-shirts and most of our workout clothes on the rack. The hooks that aren't being used can also hold hangers. I bought a clip that I use to hold my underwear. I really wanted these decals I found on Etsy, but I was a little cheap when going to purchase because the size I wanted would be more expensive than the listing price. My hesitation was rewarded because I ended up finding this decal at Hobby Lobby, my new favorite craft store, for $11 on sale. I would add a comment about the decal being sarcastic, but the sarcasm is obvious, and great. It was easy to adhere to the wall. Just make sure the wall is clean, dry, and use a measuring tool. It's great that if you get bored with it, it can easily be removed. I wanted to make something that was similar to my personalized subway sign, but not as involved as that project. I decided to purchase a small canvas and some letters to make quick and easy signs. Originally I was going to glue the wooden letters on, spray paint, and then paint the sides black, but a pattern was necessary so I went with the chevron/zig-zag. It was easy to do. Use painters tape to make the zig zag pattern, spray paint, dry, and tear off. When spray painting the canvas, I also took care of the letters. Make sure to sand and clean the letters before painting. Then glue on the letters with some wood glue. It took very little time and cost less than $10 to do per sign. I really wanted a little bit more to add and didn’t want the walls to be distracting so I looked at the floor and made a decision. A runner was needed. Again, IKEA to the rescue with the Roholt rug. It adds a basic pattern and don't forget the skid tape underneath. I still want to add a decorative window shade and a place for the ironing board, but that will come in the future. Overall, it wasn't a huge re-do project, but when I walk in the room, the laundry still isn't loads of fun, but the room is much more pleasing to the eye. As far as the costs go, that's just one dinner for two at a nice restaurant! Labels: Home., Ikea., Laundry Room.